This campaign book would cross-fertilize well with the Millennium's End RPG. Also see Merc for classic mercenary background. "Bandits calling themselves freedom fighters have kidnapped an oil company engineer. They want four million in ransom, and the guy's relatives are poor as churchmice. The goons figure the engineer is so valuable the oil company will pay to get him back, but they're wrong on two counts. …The company's only paying one million. …And they're paying it to us. 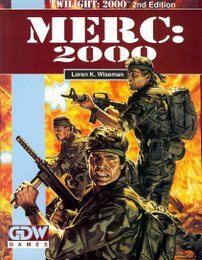 Merc: 2000 is a game of daring night raids on enemy camps, audacious hostage rescues, and tense industrial sabotage missions in exoticforeign locales, it is an alternate world situation for use with Twilight: 2000, GDW's roleplaying game of survival in a devastated world, in Merc: 2000, the world did not blow itself up. The old bi-polar superpower conflict is gone, replaced by a multipower competition. What armies remain are kept purely for internal security at reduced levels. When a war becomes necessary, a country (or company) will hire independent contractors — mercenaries — to conduct it. "Although the first signs of the cataclysm appeared in the mid-1980s, it was not until a decade later that the extent of the geological and ecological disaster became apparent. By the early 21st century, humankind had begun its retreat from an increasingly hostile surface to the safety of vast subterranean shelters. By AD 2020, the churning, spitting earth came to a boil. Billions died, and entire species were consumed. The few surviving humans huddled in their scattered iron and steel tombs and waited. Four hundred and fifty years after it had sealed itself off, humanity returned to the daylight and was greeted by a radically altered world — a world that logically should not exist. A world populated by creatures from all of earth's past geologic eras. The Xenozoic era is the brainchild of artist/writer Mark Schultz, and the extraordinary adventures of the surviving humans have been published in comic form by both Kitchen Sink Press and Epic Comics. Now the detailed and colorful background of the Xenozoic era combines with the critically acclaimed Twilight: 2000 game system to provide you with a roleplaying extravaganza! • A complete game—character generation, combat, tasks, equipment, dinosaurs, adventures, and much more! • Compatible with Twilight: 2000 and all its supplements and sourcebooks! • A treasure-trove of background information for comic fans! 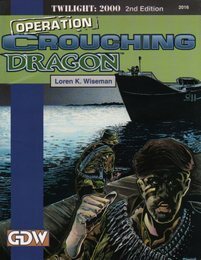 • Lavishly illustrated by Mark Schultz!" This handbook includes all major military weapons in service with the world's armies in the year 2000, plus older weapons from past conflicts: WWII, WWI, and even some weapons of the colonial wars of the last century! 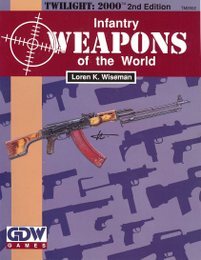 Weapons covered in this book include the Automag .44, Colt Detectives Special, HK4, Mauser M1896, P-08 Luger (three varieties), Remington XP-100, Welrod .32, M-45 Carl Gustav, M3A1, Madson M50, S&W M76, VP-70, AR-7 Explorer, BM-59, H&H .600 Nitro Double Express Elephant Gun, .45 Martini-Henry, Stoner 63 series (Carbine, rifle, LMG, and HMG), H&K CAW, SPAS-15, and hundreds more." 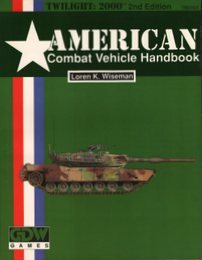 "American Combat Vehicle Handbook supplements and extends the basic vehicle listing provided with the 2nd edition Twilight: 2000 rules. More than 60 vehicles are represented (only 11 repeated from the basic game), ranging from the latest variations on the M1 Abrams to the M42 Duster 40mm self-propelled antiaircraft vehicle. Vehicles include four versions of the Bradley IFV, the M151 Jeep, M42 Duster, M551 Sheridan, M728 CEV, M48A3, M88 ARV, M109, M110, and many other vehicles in current or recent service with the US Army. In addition, the American Combat Vehicle Handbook includes three prototype combat hovercraft and two experimental laser air defense self-propelled artillery vehicles. All vehicles are completely described for use in Twilight: 2000 games, but the data is presented so as to be of interest to modern vehicle enthusiasts even if they don't play Twilight: 2000 or any game at all. 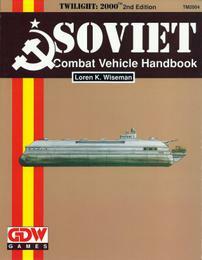 To top it off, the vehicle guide includes eight pages of color plates showing representative vehicles in their field color schemes..."
"Soviet Combat Vehicle Handbook supplements and extends the basic vehicle listing provided with the Twilight: 2000 rules. More than 60 vehicles are represented, ranging from the WWII BA-64 armored car and the T-34/85 tank through the latest variations of the T-80 to the T-90 FST (future Soviet tank). Vehicles include five versions of the BTR, amphibious GAZ-46 and PT-76, Yugoslav M-80, M-60P APCs, Romanian TAB-72, TAB-77, TAB-90 APCs, Chinese Type 531 APC, and many other Soviet, Czech, Hungarian, Polish, and even American vehicles in current or recent service with Warsaw Pact armies. Plus a prototype binary propellant tank gun and three combat hovercraft not presently in service. To top it off, the vehicle guide includes eight pages of color plates showing representative vehicles in their field color schemes -- a tremendous resource for modern vehicle enthusiasts, modelers, referees, or players who wonder what their tank might look like. All vehicles are completely described for use in Twilight: 2000 games, but the data is presented so as to be of interest to modern vehicle enthusiasts even if they don't play Twilight: 2000 or any game at all." 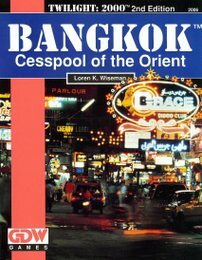 "Bangkok is the first adventure/campaign sourcebook written especially for the revised Twilight: 2000 game system. It presents players and referees with a totally new and different background against which to adventure: Thailand. Bangkok describes the geography, climate, peoples, and culture of Thailand, giving maps of the major cities, a rundown on the three main political factions, and complete organizational details of the various armies. From the opium warlords of the Golden Triangle to the 'sea gypsies' of the Gulf of Thailand, from the primitive hill tribes of the northeast to the sophisticated mercantile/criminal syndicates of Bangkok itself, each region of the country is fully described. Each section also includes a short folio-type adventure set in that part of the country. 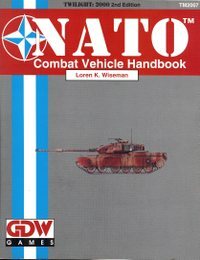 Further chapters provide adaptations to the slightly different milieu of Merc: 2000, enabling Bangkok to be used with campaigns for that system as well..."
"The NATO Combat Vehicle Handbook, like its predecessors, supplements and extends the basic vehicle listing provided with the 2nd edition Twilight: 2000 rules. More than 60 vehicles are represented, from more than six nations (France, Germany, Great Britain, the Netherlands, Turkey, Austria, and others). Vehicles include the German Leopard III, TPz1 Fuchs and Wiesel, the British Vickers Valiant, FV-4333 Stormer, and FV-721 Fox, VABm AMX-10RC, the Brazilian EE-T1 Osario, the Austrian Steyr 4K 7FA-K SPz, and numerous others. All vehicles are completely described for use in Twilight: 2000 games..., but the data is presented in such a form as to be of interest to modern vehicle enthusiasts even if they don't play Twilight: 2000 or any game at all." 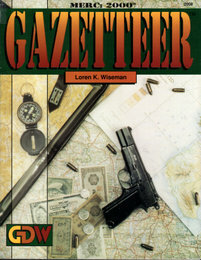 "The Gazetteer is a sourcebook for global hot spots in the strife-torn world of Merc: 2000. From the coup in Tonga to the border dispute between the Russian Republic and Japan; from the Second Nigerian Civil War to the Basque insurgency in Spain; from the battlefields of west Africa to the crime-torn city streets of America; the Gazetteer covers them all. Every aspect of warfare in the year 2000 and beyond is presented, ranging from brushfire wars in remote parts of the globe, to terrorist activities in our own backyard. Every major world trouble-spot in the year 2000 is covered with maps, a background summary of the conflict, military organizations of the participants and suggestions for conduct of the adventure scenarios as part of that conflict..."
"The Nautical/Aviation Handbook includes eight new watercraft, ranging from the Hayes Barracuda (a two-man minisub) to the SAR-38 (a 12-man light reconnaissance patrol boat). In addition to rules for aircraft, the Nautical/Aviation Handbook contains statistics and game ratings for 29 fixed wing and 35 rotary wing aircraft, including the A-10 Thunderbolt II, AC-130H Spectre, AV-8B Harrier II, CV-22 Osprey, F.1 Mirage, F-15EStrike Eagle, F-5E Tiger II, MC-130H Combat Talon, Panavia Tornado, Su-25 Frogfoot, A129 Mangusta, AH-64 Apache, AS.350 Ecureuil, MBB/Kawasaki BK-117, Mi-28 Havoc, RAH-66 Comanche, SA.341 Gazelle, and UH-60 Blackhawk. 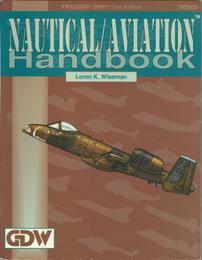 The aircraft rules included with the Nautical/Aviation Handbook are fully compatible with...all GDW roleplaying games that use the Twilight: 2000 system. Rules are included for air-to-air, air-to-ground, and ground-to-air combat, in-flight refueling, ditching, crash-landing, and parachute drops (both personnel and equipment). To top it off, the vehicle guide includes eight pages of color plates showing representative vehicles in their field color schemes." * The Rumors of Our Extinction...: Biotechnologically resurrected from a few, faint DNA traces, titanic reptiles from the age of dinosaurs stalk the deserts of New Mexico, searching for something to eat. * The Orpheus Extract: A pair of agents wants your help to free a colleague held hostage. A German intelligence officer holds a captive whom he believes can put a secret base back into operation. Poised between the two sides hangs a deadly secret, and the PCs could tip it toward their own salvation or destruction. * This Ain't No Weather Balloon: On the trail of a lost business tycoon, the PCs discover a crashed saucer from another world, and its mysterious zombie guards. * Warlord: An unseen warlord bent on world conquest, a secret mountain factory using slave labor, and a terrorized village draw the PCs into an encounter with the unexpected. 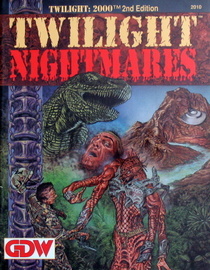 Twilight Nightmares contains six fully developed adventures and four short scenarios which can be introduced as encounters in almost any other campaign, as well as perforated and color pages containing player handouts to help spice up the adventures and aid the ease of play." 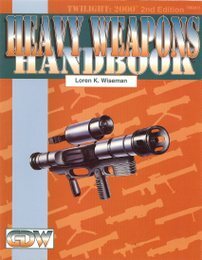 "The Heavy Weapons Handbook finishes what Infantry Weapons of the World started, by rating over 170 rocket launchers, grenade launchers, antitank and antiaircraft missile launchers, towed field, antitank, and antiaircraft guns, grenades, mines and other support weapons for Twilight: 2000. Infantry units armed only with rifles and machineguns are only half equipped, the Heavy Weapons Handbook provides the rest of what you'll need. Weapons covered range from man-portable missile launchers such as the LRAC F1, the Eryx, and the venerable American bazooka, antitank missiles ranging from the aging SS-11 surface-to-surface missile to the FOG-M(Fiber Optic Guided Missile), and towed antiaircraft guns from the Swiss 20mm Oerlikon to the Soviet 130mm AA gun. The Heavy Weapons Handbook also includes antipersonnel and antitank mines, and recoilless rifles ranging in size from the US M18A1 57mm to the Soviet B-11 107mm. Each weapon is illustrated, and each entry contains all information needed for use in the Twilight: 2000 game system, including full combat statistics, weight, price, and availability ratings for both the weapon and ammunition." 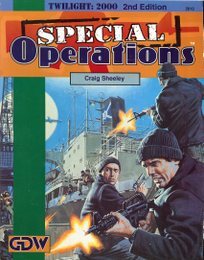 "Special Operations is a dark twist on the already shady world of Merc: 2000. It includes more information on the organizations that most mercenaries will get to know on a business basis: The CIA, DIA, FBI, KGB, GRU, MI-6, etc. It also includes enhanced combat rules, including rules for non-lethal combat, precision weapons fire, new melee weapons, the effects of antitank weapons on living creatures, and weapon specialization. Of course, Special Operations contains adventures, both for the survivalist world of Twilight: 2000 and the more complex politics of Merc: 2000." "Before the war, there was growing optimism over the collapse of communism and the opening of Eastern Europe. Survivalist organizations were sen as outdated and unnecessary, and their memberships dwindled. Many of the remaining members were labeled crazy and were ridiculed. Then the war came, vindicating their beliefs. Now a small band of survivalists known as the Nova Direkto is making a move for dominance in northern Poland. To keep the neighboring warlord at bay, they have kidnapped five children from the warlord's camp in Kwidzyn and are holding them hostage in a medieval castle on the coast. * Four pages of full-color maps of the castle. * A 16-page adventure detailing the castle's interior, the surrounding village, and the Baltic coast of Poland." This screen contains most of the conversions necessary to bring your 2.0 game up to 2.2 rules without the rare and expensive 2.2 rulebook. GDW released an errata slip, dated 28 October 1992 for the Ref Screen. 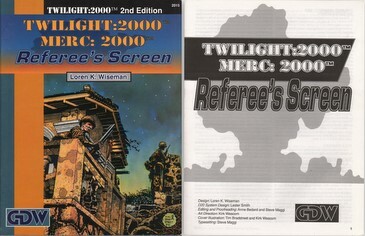 "The Twilight: 2000 Ref's Screen is fully usable with Twilight: 2000, Merc: 2000 and the other products in the Twilight: 2000 system.... [The tri-fold screen] comes wrapped around a 16-page booklet containing new D20 game mechanics, consolidated small arms and heavy weapons listings (From both Small Arms of the World and Heavy Weapons Handbook), rules extensions to character generation, combat (including a system for skill-based fully automatic fire), still more charts (in a 4-page pull-out section), and optional rules including (among other things) the first treatment of enhanced damage rounds (such as hollow points and mercury loads) in the Twilight: 2000 system. The new D20 game mechanics expand the range of possible task results and increase the speed, simplicity and flexibility of the game system, at the same time bringing a greater sense of realism and enjoyment." "In the South China Sea lie a group of very tiny islands, some of which are under water at high tide. The British call them the Spratlys and marked them on charts only because they were a hazard to navigation. They were never of much use to anyone until oil was discovered underneath them. In AD 2000, five nations claim the islands, five nations have assigned them names, five nations have sent survey parties and military units to secure their claims, five nations have made arrangements with oil companies for their exploitation. The team is hired by one oil giant to spy out what the competition is up to. Easy as pie, right? In the middle of their mission, however, they make a discovery that is infinitely more important to their long-term survival... they discover what their patron is up to..."
"Information is vital to any military campaign. Without it, armies blindly wander without real objectives, blundering into the enemy by chance, with no opportunity for advance planning or preparation. 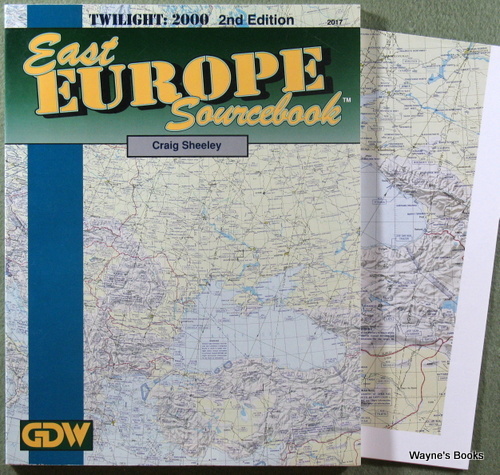 The East Europe Sourcebook for Twilight: 2000 gives you the information you need to know about the central theater of the Twilight War. Eastern Europe was, without a doubt, the "center stage" of the Twilight War. It was in Eastern Europe that the armies of every major belligerent met; it was in Eastern Europe that the war lasted the longest; and it was in Eastern Europe where the devastation of war was greatest. The East Europe Sourcebook provides a chapter on each of the nations of the region, giving a short summary of the nation's history, and its military forces plotted on an individual situation map. Nations covered include Estonia, Latvia, Lithuania, Poland, Russia, Ukraine, the Czech and Slovak Republics, Hungary, Romania, Bulgaria, Turkey, Greece, and the splintered remains of the former nation of Yugoslavia. More than 30 military vehicles are detailed, illustrated, and described in game terms, including the major vehicles used by the nations of the region, all fully updated to Twilight: 2000, version 2.2. The vehicle pages concentrate on the non-Russian members of the Warsaw Pact, covering Romanian, Yugoslavian, Czech, Hungarian, and Polish military vehicles ranging from the Hungarian FUG scout car to the Romanian TR-85 main battle tank. If that weren't enough, the East Europe Sourcebook also includes a detailed full-color map of Eastern Europe, and two short adventures set in the region." More-or-less a reprint of the original module "Free City of Krakow" with 2nd edition rule changes. It is labeled "The Vistula Epic, Volume 1," presumably with "Pirates" and "Warsaw" intended to follow on. GDW closed its doors before this took place. 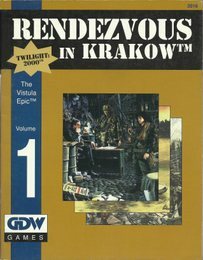 "Rendezvous in Krakow is the first of three linked adventures forming The Vistula Epic for Twilight: 2000 2nd edition. Krakow has been spared the worst of the war's devastation, and has declared itself a free city. The war is banished, and individuals are free to come and go... so long as they leave the war behind. Background material includes street maps with points of interest, from Wavel Castle to the "Wojo" munitions plant. Many non-player characters are described in detail as well as the Krakow ORMO and the marauder bands of the surrounding countryside. The city's economy, culture, and atmosphere combine to make the Free City of Krakow a rich adventure environment. 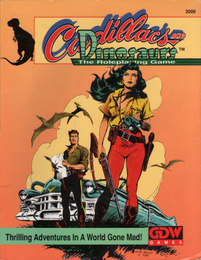 Set against this backdrop is the adventure, which thrusts the player characters into the midst of intrigue and treachery as they pursue the secret of Operation Reset, and in the process gain the attention of several intelligence agencies and Krakow's most interesting (and dangerous) citizens." "Death on the Vistula is the second installment in the Vistula Epic campaign. The mighty Vistula River sets the stage for a journey from Krakow to the ruins of Warsaw aboard the armed river tug Wisla Krolowa. But the Vistula has seen better days. The river has been left unattended for years as the war raged around and across it, and now is filled with debris and silted channels. 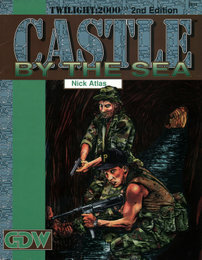 The book provides a series of semi-independent adventures set along the banks of the river, each one a convenient one or two-session episode, from delivering towns from the grip of tyrannical marauders to choosing sides between warring bandit kings to simply eluding the powerful pirate fleet that dogs the course of the Wisla Krolowa. All of the important forces along the river, such as the bandit and marauder units and, of course, the vicious river pirates, who virtually rule the river, are detailed in terms of numbers, equipment, and motivation. Death on the Vistula gives a rich, detailed look at the entire course of the upper Vistula and its environs, a small but fascinating part of the war-ravaged world of Twilight: 2000." Basically a 2nd edition rehash of Pirates of the Vistula. It never saw print. "The future ain't what it used to be... Armor 21 takes the Twilight: 2000 game system into the unforgiving battlefields of the next century. These are not the battlefields of a post-holocaust world; these are the battlefields of 2020-2030 that the armies of the world are planning for today. Based on cutting-edge research and technology projections, Armor 21 places you on a battlefield of brilliant munitions, active armor, real-time intelligence, intelligent mines, and digitally-enhanced infantry straight out of science fiction. Victory on the battlefields of 2025 will require warfighters able to operate sophisticated machinery as an extension of themselves, while at the same time possessing the physical and moral courage necessary to live in water-filled foxholes and to take on the enemy with nothing more sophisticated than cold steel. Become that warfighter with Armor 21." "I think Frank told me about your Armor 21 inquiry at the time. I have the camera-ready color proofs for the Armor 21 covers, as I was going to be the designer for that. But in the last year I got pulled off that to keep TNE [Traveller: The New Era] running. 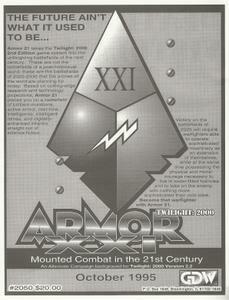 I was a member of the Advanced Warfighting Working Group, a think-tank at the US Army Armor School, and the Armor 21 logo was actually the AWWG's logo (used with permission), and we were going to use a lot of ideas out of that, which would obviously have been a lot more advanced than where we'll really be in 2030 (in fact that US Army has drunk the Kool-Aid that there won't be no stinking armor in 2030). Satellite-beamed power down to mobile converters that recharged light, mobile AFVs with active, electro-static armor and ETCs and/or rail guns as the top tier for national Army intervention/rapid-deployment forces, advanced "conventional" vehicles for second-tier and mercenaries, and lots of M1, Challenger II, Leclerc-class vehicles in the "Third World." One of the wrinkles was going to turn the tables on environmentalism, that preserving rain forests and biodiversity was huge business for big pharmaeutical and bio-tech companies, and they would be defending them via merc armies against the usual Twilight/DarkCon marauders. So it was going to have a lot of Merc 2000/Dark Con "areas of chaos" zones. Oh, and Frank wanted Africa to be depopulated by AIDS, but I suggested it might be a little more sensitive, and more SF if we went with all of the flesh-eating bacteria stuff that everyone loves so much. And that way we wouldn't have to talk to kids about STDs, which would save us some arguments. There would have been tri-hulls like the LCS 2 Independence in the navies. Tilt-rotor carriers to bring the mobile electrically-powered AFVs into battle, big solar-powered battle management and power-relay vehicles circling for weeks at umpteen thousand feet." The Twilight: 2000 game in all forms is owned by Far Future Enterprises. Copyright 1977 - 1998 Far Future Enterprises. Twilight: 2000 is a registered trademark of Far Future Enterprises.